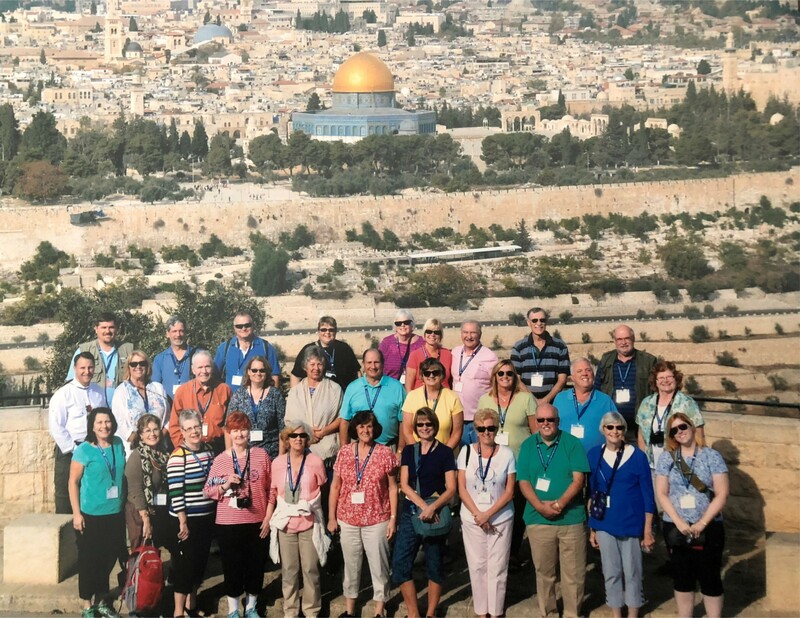 The group from the Presbytery of Redstone gather for a photo on the top of the Mount of Olives during their recent trip to the Holy Lands. 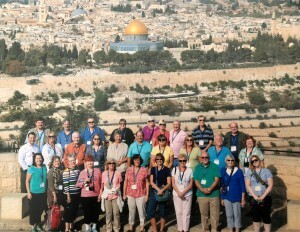 In October 2017, 29 pilgrims had a unique 13-day immersion experience in Israel, Jordan and the West Bank. Veteran Bible Lands travelers, Pastors Jim Farrer of Jennerstown and Norma Murphy, interim at Titusville, organized the trip with the Jerusalem Biblical Studies Society. It was endorsed by the Presbytery of Redstone. Other ministers included Elizabeth Affsprung of Williamsport, Curtis Paul of Murrysville, Mike Shepard of Uniontown, Alice Tondora of Johnstown, Mark Unrue of Uhrichsville, Ohio, and New York United Methodist pastor Pam Carey. Commissioned Ruling Elders included Lisa Dabney of Williamsport and Lynn Manse of Delmont. Each of these leaders read and interpreted Bible passages for the group at places they found most meaningful to them. Unlike nine- and 10-day tours that include mostly the Sea of Galilee area, the Dead Sea and Jerusalem/Bethlehem, this pilgrimage covered Israel from top to bottom. Leaving Tel Aviv airport, the group headed south to Beersheba where Abraham traded seven lambs for a well and where Isaac and Rebekah settled. How vivid was the battle site of David and Goliath for the travelers! The first night was spent in a Jewish Kibbutz farm and vineyard overlooking the West Bank Separation Wall. Then, deep in the Wilderness of Zin desert, the pilgrims hiked Ein Avdat, a remarkable canyon with streams and waterfalls, where they had a closeup view of a dozen ibex. A fabulous panorama at the geologic Makhtesh Ramon Crater was followed by a trip to Solomon’s Mines and a unique replica of the Tabernacle. At Eilat at the north end of the Red Sea, the group could view Egypt and Saudi Arabia before crossing into Jordan. The next overnight was spent in Petra, and the following day found most of the participants walking five to seven miles at the Red Rock City while others rode in horse-drawn carts. Other sites in Jordan included the place at the Amman Citadel where David sent Uriah to the battlefront to be killed. The museum there houses the “earliest statue produced by humans,” which was crafted at Jericho. Some felt that the quiet time on Mt. Nebo where Moses overlooked the Promised Land held special meaning for them. Also at Mt. Nebo, the travelers chatted with handicapped craftspeople who produce unique mosaics with age-old techniques. This day concluded at the probable site of Jesus’ baptism on the Jordanian side of the Jordan River. Remarkably no other travelers were on either side of the stream, and the pastors anointed the pilgrims in renewal of baptism. Several new Orthodox churches have been built on traditional holy sites nearby only after at least 4,000 land mines were removed before any construction and visitation could occur. From left, Roger Miller, Elizabeth Affsprung and Jane Bradshaw take in the area around Caesarea Philippi. The next two nights were spent in Jericho in Palestinian territory. On previous pilgrimages, travelers with Farrer and Murphy had visited the Mount of Temptation Monastery hanging halfway up the cliff of the mountain, but because of time restraints a stop here was impossible. On this tour the group rode the huge gondola to the summit of Masada, visited the Qumran community where the Dead Sea Scrolls were found, viewed the Ein Gedi canyon where David hid from King Saul, and relaxed at the end of the day with a swim in the Dead Sea. In Jerusalem, the pilgrims walked the Via Dolorosa and visited the Garden of Gethsemane, the Holocaust Museum, the Western Wall, the City of David and the Pool of Siloam. Other highlights were discussions with a very knowledgeable Jewish rabbi Moshe Avraham Kempinski and a visit to the Jerusalem Center for Bible Translators. At the Shepherds’ Field area, during lunch, the travelers were surprised to find pastor friends Steve and Meta Cramer from Upper Ohio Valley Presbytery as well as Pittsburgh area pastor and author Dr. Graham Standish. Since Victor and Sara Makari, PCUSA Mid-East Associates for Ecumenical Partnerships, were serving in other assignments in Israel and Palestine, an insightful discussion was arranged with local Christian Palestinian pastor Rev. Nihad Salman at the Immanuel Evangelical Church-Bethlehem about the plight of area Christians, especially in Bethlehem. Unique to this pilgrimage were trips to Bethel and later to Shiloh where following 40 years of wandering in the wilderness Joshua erected the Tabernacle that stood here for 369 years. The group also met with the high priest of the Samaritans at Mount Gerizim for an interactive discussion. 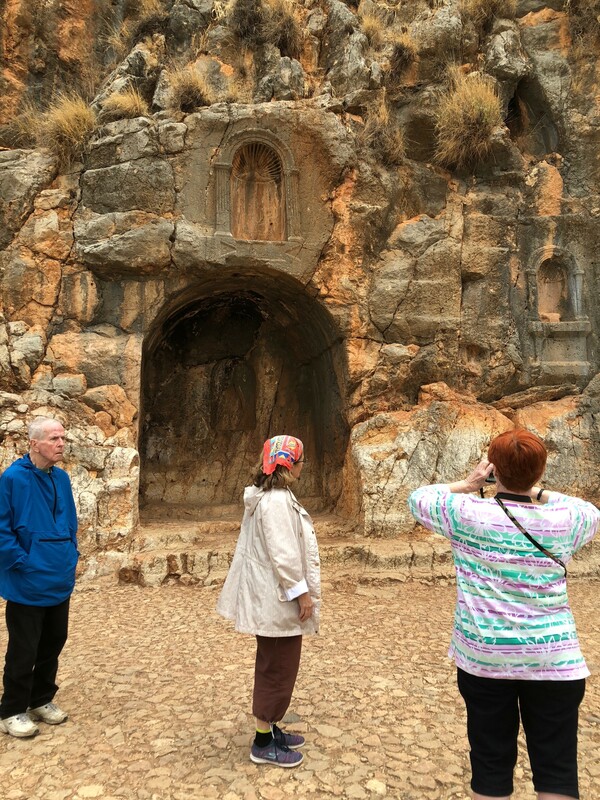 Nearing the end of the pilgrimage were a visit to Nazareth, renewal of baptism at Caesarea Philippi, seeing the ancient mud gate that Abraham likely visited at Tel Dan and looking across the Syrian/Lebanon borders. It was important to be on the Golan Heights to better understand its strategic importance. This pilgrimage attempted to give broad and balanced insights into this complex region. After staying in another Kibbutz on the Sea of Galilee and “swimming where Jesus walked,” the travelers found Holy Communion on the boat ride across the lake to be especially meaningful before climbing to the Mount of Beatitudes. A visit to Capernaum followed, and the pilgrimage concluded at Caesarea on the Mediterranean Sea. Main guide Brian Kvasnica is an American who has lived in Jerusalem for 50 years, is a PhD student at Jerusalem University, has excavated at Bethsaida and Byzantine Kursi and teaches Bible translators from around the world. For one day in Jerusalem another certified guide Malkah, an Orthodox Jewish woman, joined the group. Since this was an in-depth study tour interrelating the scriptures with Biblical history, archaeology, geography and ancient Jewish literature, prior to going the pilgrims received two books – a timeline of the Israel/Palestinian conflict and a summary of Islam. Participants expressed some surprise at how aligned Jesus was with the Old Testament scriptures, and the ministers considered this experience to be equal to at least one year of seminary study since the Bible came alive at each new site. Most of the group expressed little anxiety over safety issues and felt very safe with their group. If one thinks s/he is too young or too old to go on such a pilgrimage, consider that on previous trips Farrer and Murphy have taken teenagers, a 98-year-old woman and a colleague who has difficulty walking from the effects of a stroke. The leaders hope to go again in two or three years and encourage other Presbyterians from our Synod to experience the Bible Lands.